Scientists, including several from the University of California, Riverside, have developed a transparent, self-healing, highly stretchable conductive material that can be electrically activated to power artificial muscles and could be used to improve batteries, electronic devices, and robots. The findings, which were published today in the journal Advanced Material, represent the first time scientists have created an ionic conductor, meaning materials that ions can flow through, that is transparent, mechanically stretchable, and self-healing. The material has potential applications in a wide range of fields. It could give robots the ability to self-heal after mechanical failure; extend the lifetime of lithium ion batteries used in electronics and electric cars; and improve biosensors used in the medical field and environmental monitoring. "Creating a material with all these properties has been a puzzle for years," said Chao Wang, an adjunct assistant professor of chemistry who is one of the authors of the paper. "We did that and now are just beginning to explore the applications." This project brings together the research areas of self-healing materials and ionic conductors. Inspired by wound healing in nature, self-healing materials repair damage caused by wear and extend the lifetime, and lower the cost, of materials and devices. Wang developed an interest in self-healing materials because of his lifelong love of Wolverine, the comic book character who has the ability to self-heal. Ionic conductors are a class of materials with key roles in energy storage, solar energy conversion, sensors, and electronic devices. Another author of the paper, Christoph Keplinger, an assistant professor at the University of Colorado, Boulder, previously demonstrated that stretchable, transparent, ionic conductors can be used to power artificial muscles and to create transparent loudspeakers – devices that feature several of the key properties of the new material (transparency, high stretchability and ionic conductivity) – but none of these devices additionally had the ability to self-heal from mechanical damage. The key difficulty is the identification of bonds that are stable and reversible under electrochemical conditions. Conventionally, self-healing polymers make use of non-covalent bonds, which creates a problem because those bonds are affected by electrochemical reactions that degrade the performance of the materials. Wang helped solve that problem by using a mechanism called ion-dipole interactions, which are forces between charged ions and polar molecules that are highly stabile under electrochemical conditions. He combined a polar, stretchable polymer with a mobile, high-ionic-strength salt to create the material with the properties the researchers were seeking. The low-cost, easy to produce soft rubber-like material can stretch 50 times its original length. After being cut, it can completely re-attach, or heal, in 24 hours at room temperature. In fact, after only five minutes of healing the material can be stretched two times its original length. Timothy Morrissey and Eric Acome, two graduate students working with Keplinger, demonstrated that the material could be used to power a so-called artificial muscle, also called dielectric elastomer actuator. Artificial muscle is a generic term used for materials or devices that can reversibly contract, expand, or rotate due to an external stimulus such as voltage, current, pressure or temperature. The dielectric elastomer actuator is actually three individual pieces of polymer that are stacked together. The top and bottom layers are the new material developed at UC Riverside, which is able to conduct electricity and is self-healable, and the middle layer is a transparent, non-conductive rubber-like membrane. The researchers used electrical signals to get the artificial muscle to move. So, just like how a human muscle (such as a bicep) moves when the brain sends a signal to the arm, the artificial muscle also reacts when it receives a signal. Most importantly, the researchers were able to demonstrate that the ability of the new material to self-heal can be used to mimic a preeminent survival feature of nature: wound-healing. After parts of the artificial muscle were cut into two separate pieces, the material healed without relying on external stimuli, and the artificial muscle returned to the same level of performance as before being cut. 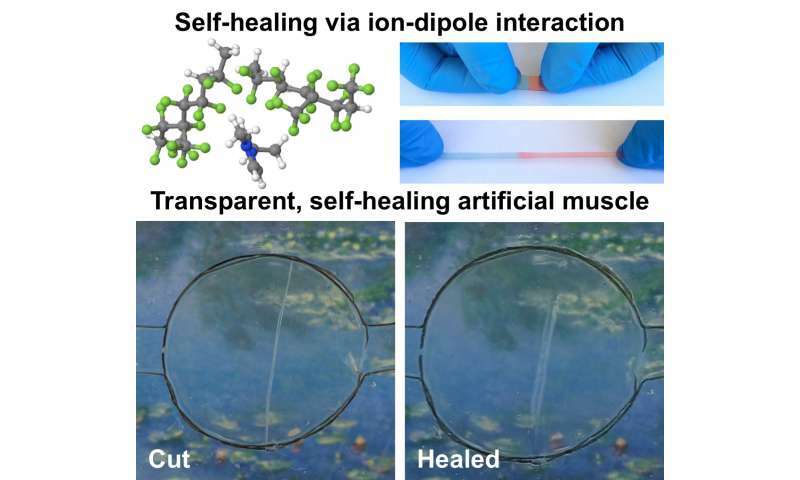 The paper is called "A transparent, self-healing, highly stretchable ionic conductor."